A major new volume on the acclaimed writer and artist. In this highly illustrated new book, Mervyn Peake's son Sebastian has collaborated with Alison Eldred and G. Peter Winnington, author of an acclaimed biography of Mervyn Peake, to compile a stunning collection of illustrations, paintings, photographs, letters, notebook pages and other material – much of which has never been published – to produce a unique memoir of the artist's life and work. Contributors who discuss various aspects of his literary and visual output include the writers Michael Moorcock and Joanne Harris, Langdon Jones, editor of Titus Alone, artists Chris Riddell and John Howe, conceptual designer of Peter Jackson's Lord of the Rings trilogy, David Glass and John Constable, creators of the stage version of the Gormenghast trilogy, and Estelle Daniels, producer of the BBC dramatization. It is now sixty years on from the first publication of Titus Groan, one of the most sustained flights of imaginative writing of the twentieth century, and the time is ripe for a reassessment of the legacy of one of Britain's most original artists. 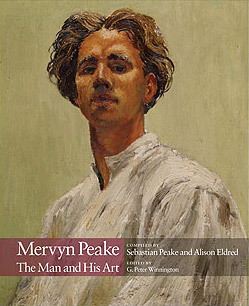 This handsome volume is a must for art historians and all fans of Mervyn Peake's work.